The EMMA™ Down-sanding Telescoping Stand System (D-90) allows operators to perform surface preparation to the side or down on a horizontal surface. Like the related EMMA Stand System, the Down-sanding Stand System rolls independently along the floor or follows a guide rail, and is controlled via the Joystick Box. The EMMA Down-sanding Stand System is typically used for vertically hung parts, small parts on a “table-top” fixture, or the top of the wings of small aircraft. Click here for EMMA Ground Systems Brochure. 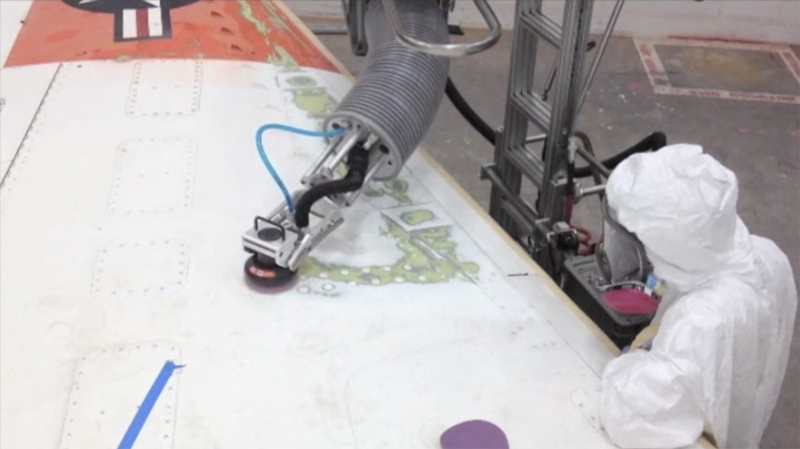 The video below is a compilation of clips showing our EMMA™ Stand Systems - both TSS and Down-sanding TSS - performing a variety of Aerospace manufacturing and maintenance operations, including surface reactivation, filler/surfacer feathering, and full de-paint.